We’re very familiar with online slots from Realistic Games but now they’ve turned their attention to blackjack, the iconic casino game with the lowest house edge available. Blackjack Five Hand is certainly a good-looking example of the genre and, as the title suggests, you can play up to five hands simultaneously. Your aim is to obtain a card value of more than the dealer but not more than 21. 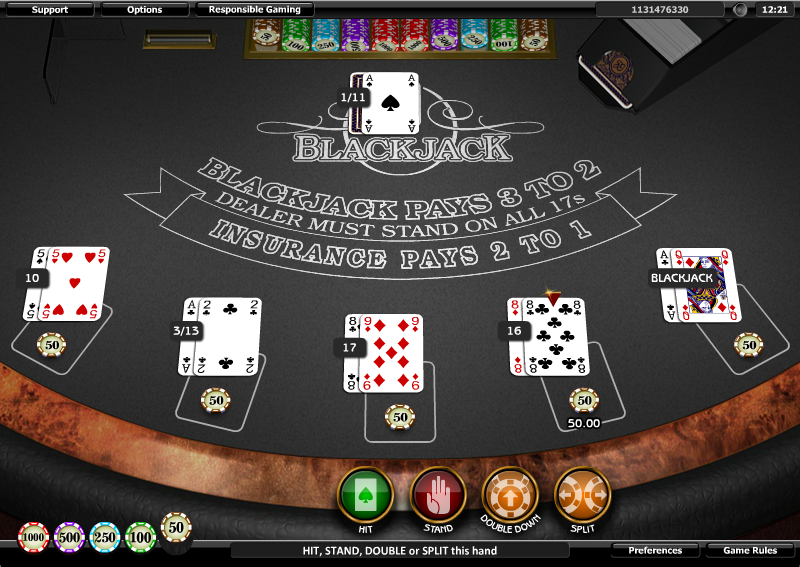 The layout of this game will be familiar to anyone used to playing blackjack online or offline; the dealer’s area is at the top of the screen where the cards and chips are stored and the player’s area is the five card spaces arranged near the bottom. The main payout information is printed in the centre and these are standard blackjack terms. The first thing to do is choose your chip level and the betting ranges from £1.00 to £2500 per hand. Place a chip on one or more of the betting areas when you know how many hands you want to play. Once you’ve finished, the dealer plays his hand.The dealer stands on 17 or higher and when finished, your hands will be compared. Any blackjacks are paid out at 3/2, other wins at evens. There’s a feeling of real quality to this game from the graphics and animations to the choice of voiceovers describing your game. Don’t forget to use blackjack basic strategy to ensure you reduce the house edge to the minimum 99.50%.